At 3:40 a.m. EST on Saturday, Dec. 7, 1968, just three weeks before the highly anticipated launch of Apollo 8 and the first crewed flight to the Moon, an Atlas-Centaur rocket carrying NASA’s heaviest and most ambitious unpiloted satellite at the time blasted into the sky from Launch Complex 36B at Cape Canaveral Air Force Station, Florida. Formally known as the Orbiting Astronomical Observatory (OAO) 2 and nicknamed Stargazer, it would become NASA’s first successful cosmic explorer and the direct ancestor of Hubble, Chandra, Swift, Kepler, FUSE, GALEX and many other astronomy satellites. OAO 2 provided the first orbital stellar observations in ultraviolet light, shorter than wavelengths in the visible range spanning 3,800 (violet) to 7,500 (red) angstroms. Much of UV light is screened out by the atmosphere and unavailable to ground-based telescopes. Stargazer’s experiments made nearly 23,000 measurements, showed that young, hot stars were hotter than theoretical models of the time indicated, confirmed that comets are surrounded by vast clouds of hydrogen and discovered a curious feature of the interstellar medium that would take decades to understand. “OAO 2 was a learning experience,” said Nancy Grace Roman, the first chief of astronomy in the Office of Space Science at NASA Headquarters, Washington. “We had to learn how to point a telescope to a single object and hold it there for a half hour or so.” This makes OAO 2 the ancestor of all space telescopes that can point to a given spot on the sky and track it for an extended period. Watch James Kupperian Jr., the project scientist for NASA’s Orbiting Astronomical Observatories, explain the Stargazer (OAO 2) satellite and its instruments in this excerpt from “Seas of Infinity,” a 1968 NASA film about the mission. The feat proved much harder to accomplish than anyone had expected a decade earlier, at the outset of the program. But the development of star trackers — small telescopes located around the spacecraft that lock onto appropriate guide stars — and associated control software enabled extended UV observations that were previously impossible. Prior to OAO 2, ultraviolet observations of stars were acquired by suborbital sounding rockets that collect data for only five minutes each flight as they arc above much of the atmosphere. By 1968, it was estimated that sounding rockets had captured a total of three hours of stellar UV measurements in some 40 flights. OAO 2 could collect more data than this in a single day. In June 1958, the National Academy of Science established the 15-member Space Science Board, chaired by Lloyd Berkner, to help advise the “possible new civilian space agency” — NASA, which was established the following month when the National Aeronautics and Space Act was signed into law. After the panel’s first meeting, Berkner contacted hundreds of U.S. scientists for recommendations on experiments that could be performed by a satellite with a modest payload. At the end of the year, James Kupperian Jr., a physicist at the Naval Research Laboratory in Washington, first used “Orbiting Astronomical Observatories” in an outline of the project. The name stuck. In 1959, he moved to NASA’s Goddard Space Flight Center in Greenbelt, Maryland, to become chief of its astrophysics branch and serve as project scientist for all four OAO missions. Technicians in a clean room at NASA’s Kennedy Space Center in Cape Canaveral, Florida, check out the Orbiting Astronomical Observatory 2 before the mission’s Dec. 7, 1968, launch. The white conical structures visible near the top of the spacecraft are two of its six star trackers, small telescopes that lock onto appropriate guide stars to keep the instruments on target. Two astronomers who responded to Berkner’s request had already determined that ultraviolet observations of stars should be the initial focus for orbital astronomy. The first was Fred Whipple, director of the Smithsonian Astrophysical Observatory in Cambridge, Massachusetts, who became the principal investigator for OAO 2’s Project Celescope (from “celestial telescope”). The experiment used four television cameras to make two-degree-square images of the sky in UV wavelengths between 1,200 and 3,250 angstroms. The other scientist was Arthur Code, a professor of astronomy at the University of Wisconsin-Madison and director of its Washburn Observatory. Code became the principal investigator on the Wisconsin Experiment Package (WEP), a suite of seven telescopes. Four were designed to measure the UV brightness of stars from 1,330 to 4,250 angstroms, and a fifth, operating from 2,130 to 3,330 angstroms, was optimized for measuring the brightness of extended objects like nebulosity. Two scanning spectrometers recorded target spectra from 1,050 to 3,800 angstroms in 100 angstrom steps and at different resolutions. “It’s kind of interesting that this project grew out of an institution that had never done photographic astronomy,” notes Jordan Marché II, an adjunct professor of astronomy at the University of Wisconsin, Madison. At the time, imaging, processing and measuring photographic plates was a typical aspect of astronomical work, but Code and his colleagues emphasized photometric studies over photography. “They were in this completely different mode of thinking about doing research,” Marché said. Both experiments were mounted back-to-back within the 4,436-pound (2,012 kilogram) spacecraft and looked out opposite ends, taking turns viewing the universe. 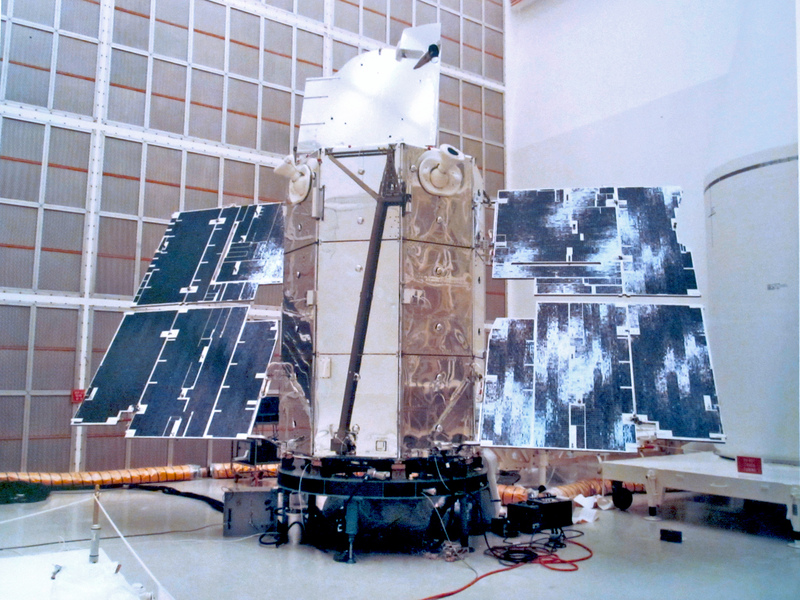 The first WEP flew aboard OAO 1 on April 8, 1966, along with X-ray and gamma-ray experiments from Lockheed, MIT and Goddard. Just seven minutes after separation from its rocket, the spacecraft began experiencing problems in its power supply, including high-voltage arcing in the star trackers. After three days and 20 orbits, controllers terminated the mission without activating any of the experiments. Take a tour of the best-ever UV image of our neighboring Andromeda Galaxy (M31), the closest large spiral to our own. Using its Ultraviolet/Optical Telescope, NASA’s Neil Gehrels Swift Observatory acquired 330 images in three UV colors. Some 20,000 ultraviolet sources are visible here, including M32, a small galaxy in orbit around M31. Dense clusters of hot, young, blue stars light up the disk beyond the galaxy's smooth, redder central bulge. M31 is located 2.5 million light-years away. OAO 2 fared much better, continuing to work until it was shut down in February 1973. Issues with the Celescope — primarily a gradual loss of sensitivity in its modified TV tube detectors, called uvicons — resulted in the experiment being turned off in April 1970. By then, the Celescope had captured some 8,500 images across 10 percent of the sky, and Whipple’s team ultimately published a catalog of 5,068 UV stars. The WEP experienced fewer problems. Some weeks after launch, a calibration source in the nebula photometer stuck in place, allowing no further data to be returned from that telescope. But while the filters in the other telescopes showed some degradation in orbit, the instruments performed well and were functioning when the spacecraft was shut down. In addition to providing important UV data on some 1,200 stars, the WEP also observed planets, galaxies and comets. One of its most striking finds occurred in early 1970, when the instrument observed comet Tago-Sato-Kosaka, which had recently rounded the Sun and was headed back out into deep space. Observations showed the comet was surrounded by a UV-emitting cloud of hydrogen bigger than the Sun, dwarfing the comet’s visible structure; a similar feature was seen around comet Bennett later that year. These findings confirmed earlier predictions based on the idea that a comet’s tiny solid nucleus was largely made of frozen water. Solar ultraviolet light breaks up water molecules streaming off the icy nucleus, resulting in a sparse but vast envelope of hydrogen atoms that scatters UV sunlight. One of the most interesting results from OAO 2 involved interstellar extinction, a measure of the way matter between the stars absorbs and scatters light. The WEP showed there was a narrow extinction “bump” — that is, an increase in the way UV light was absorbed or scattered — centered at about 2,175 angstroms. Early speculation suggested that this feature may represent evidence for graphite dust grains. But theorists have introduced more exotic possibilities in the decades since, including nanodiamonds, graphite “onions,” molecules called polycyclic aromatic hydrocarbons (PAHs) and fullerenes, large, hollow soccer-ball-shaped molecules formed by carbon atoms.